Chicago Cubs right-handed pitcher, Spencer Patton, 28, will be playing his next season in NPB (Nippon Professional Baseball) with the Yokohama DeNA Baystars, of the Central league… an announcement was made just today. Via link, an official announcement showing Patton’s contract details will soon be known shortly when he arrives in Japan… he will most likely share closing duties with current team closer Yasuaki Yamasaki, according to the report. Spencer Patton played for 3 seasons there at the Major league level (with the Texas Rangers, and Chicago Cubs respectively). He currently owns a record of 3-2 with an earned run average of 6.26 in 52 games played (54.2 innings pitched) in his big league career, as a reliever. He finished his 2016 regular season campaign with the Cubs posting a record of 1-1 with an earned run average of 5.48 in 16 games played (21.1 innings pitched). He did not appear in any games with the Cubs this postseason, but still won his first World Series ring because he was on the 40-man roster. There seems to be a crap ton of lower tier MLBers signing in Japan and Korea this year. Or maybe Ren’s reporting is more in-depth than the previous stuff from the stateside media. Anyway, good job, Ren. Keep up the good work. It’s been really busy this past few weeks in the NPB and KBO off-season, there’s still also pitcher Preston Guilmet’s recent signing with the Tokyo Yakult Swallows. The Bay Stars are one of NPB’s proverbial also-rans, with their second place finish in 1979 (when they were known as the Toyo Whales) being their closest to a postseason berth. They became the Bay Stars in 1992. That is one awesome view. 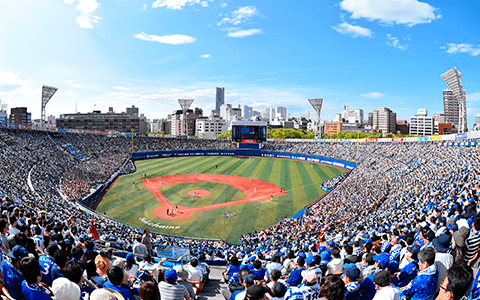 The stadium is right smack in the middle of Yokahama. Never saw a game there but walked by it several times. It’s unbroken city from Tokyo through Kawasaki and well past Yokahama so you generally don’t even know which city you’re technically in – megalopolis of the future, here today.